I am a member of the Special Parm Squad. Just saying that out loud makes me feel like I’ve taken on superpowers, or become a member of some super-elite security detail. In reality, it means that I’ve been assigned by my local food coop (where all members share in running the joint) to the team that handles breaking down wheels of parmesan cheese (for our most excellent cheese counter). Still, being part of the “special” squad does make me feel a bit like a superhero, or at a least a Navy Seal. 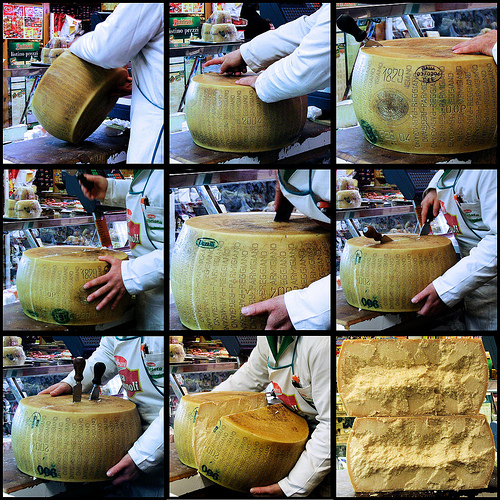 It’s no easy task to wrestle an entire, 80-pound wheel of genuine Parmigiano-Reggiano: the surface is slippery with residual oil; the wax rind, stamped with the familiar markings of its origins, is thick and tough to penetrate; the size and heft of the wheel is more than one person can handle. Your mission—should you decide to accept it—is to quarter this wheel of Parmigiano-Reggiano (delivered to us straight from the cheese caves of Emilia-Romagna, Italy) and then break the quarters down into chunks of reasonable size and shape, wrap them, weigh them and price them. You have two-and-a-half hours to complete this assignment. You will be expected to leave no trace of your presence, cleaning all surfaces of cheese chunks and flakes within the allotted time, while delivering the necessary amount of cheese to the sales floor. Your time begins: now! OK, a bit dramatic. But there’s no denying a food lover’s visceral reaction at the first experience of scoring and cutting a wheel down the middle, then separating the halves. There’s a moment, when the waxy outer ring gives way and the halves break apart, perhaps with a slight bit of crumble, that the nutty, fruity, salty aroma of 80 pounds of aged goodness smacks you in the face. On our first mission together, the three members of the squad had to step back in silence, reveling at the beauty of this man-made marvel. I had to stop again a bit later after coming upon the hollowed out bit near the surface where the cheese maker had sampled a plug from the wheel during the aging process to check on its progress. Here was evidence of the hand of an individual, half a world away, who was intimately involved in the making of this single wheel of cheese. Talk about knowing where your food comes from. People have asked me how exactly we go about breaking down a wheel of Parmigianino. Whether we use big, two-handled knives, or mezzalunas, whether we chunk it using the small, heart-shaped parmesan knives you see in gourmet catalogs. Or whether we sample as we go along. I could share the answers to these questions, but then I’d have to kill you. Best to go with this advice: if you have never had a truly fresh-cut chunk of Parmigiano-Reggiano cheese, put down that shaker of powdered parmesan or that pre-cut, pre-packaged wedge from the supermarket and seek out a cheesemonger who can cut you off a bit from the wheel. After, of course, shaving off a sliver for you to taste. Your cooking and eating habits will change forever and you’ll wonder why you ever put up with that salty, dusty powder from the can or those dry shards of pre-shredded “freshly grated” parmesan in the plastic container. Good, authentic Parmigiano-Reggiano can be expensive, it’s true. But the flavor is so much more powerful that you’ll use less to achieve more. With those words, this superhero’s work is done. Go forth and make pasta! Toss the rind into broth for soup.